My husband and I just returned from a trip to California. 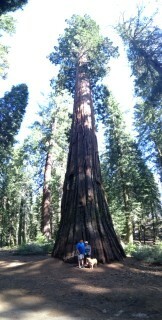 We visited Yosemite National Park, San Francisco, Muir Woods, Carmel, and Sonoma Valley. He is an excellent vacation planner and travel companion! This was one of my favorite trips with such a variety of experiences and adventures: hiking among the giant Sequoia, picnicking and wine-tasting in lush wine country, riding the rickety trolley car, shopping in the “hippie” district in the city, lunching on dim sum in colorful China Town, sipping tea in the peaceful Japanese gardens, meandering in the serenity of Cathedral Grove among the regal Redwoods, walking the dog-friendly beaches with my guide dog Sophie, breathing in the fresh, crisp air on the Coastal Trail, feasting on local seafood and wines…ahhh…I am still basking in the glow of the sweet sensory memories of it all! As I was packing, I marveled at how little I needed in my suitcase. A mere 46 lbs. of worldly trappings and accoutrements to survive a twelve day trip was all I required. I have learned to keep it simple. That way, there is less to organize, keep track of, and haul around! I love this sense of freedom from material things and it creates room in my soul to take in the new experiences. It is enlightening to consider what we can live without and how freeing it can be to shed extra baggage. In the past when I have traveled as a visually impaired person, I often experienced overwhelming fatigue, anxiety, and even irritability while trying to adjust to new surroundings. This would cause stress which took away from the ability to enjoy the adventure. This trip was different somehow. I have learned to relax and accept my limitations. I try to pace myself, yet challenge myself at the same time so as not to miss a worthwhile attraction. 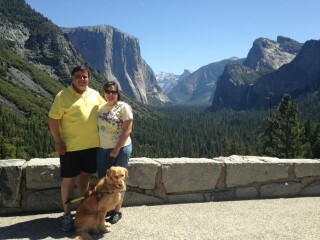 For instance, we chose to take a two-mile “moderate” hike to Glacier Point in Yosemite. It took us a few hours to painstakingly navigate a rocky course to reach a spectacular summit view. 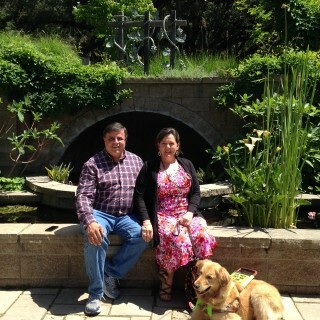 My guide dog was an amazing and attentive partner as she moved me through the obstacles of rocks, logs, and roots. My husband patiently gave me verbal instructions and a steady arm when needed. It took teamwork and concentration as the three of us plugged along the path. The payoff was arriving at the highest point in Yosemite, surrounded by unmatched grandeur; sparkling granite cliffs, terraced waterfalls, and a feeling of infinite openness and space. It was exhilarating and energizing! And the satisfaction of accomplishment spurred me onward. As visually impaired people, we sometimes have to find a different way to do things and take our time-but what joy there is in success and the experience. 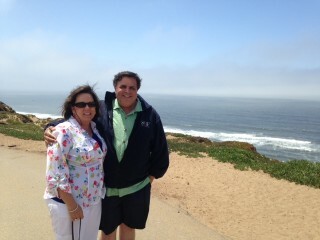 A special benefit of this trip was the opportunity to truly enjoy the company of my husband. With the distractions of home, work, and other responsibilities left behind, we were able to tune in to each other fully and refresh ourselves together. Long walks and talks on beautiful beaches can rejuvenate the mind, body and soul. I discovered that each day I could not wait to get up and going, as it meant more time with Kevin. His undivided attention was luxurious and the lazy days together felt extravagant. I wanted to make the most of “him and me” time. So travel is also about the joy of being with your loved ones. All the adventures, sights and experiences are richer when shared and the memories sweeter when made together. This entry was posted in Life With a Guide Dog, Recreation/Leisure, Traveling and tagged beach, California, guide dog, hiking, Redwoods, San Francisco, sensory, travel, vision impairment, wine-tasting, Yosemite. Bookmark the permalink. ← Why I LOVE My iPhone! Sophie is one well-travelled dog! I loved all the quotes. Yes indeed Paul…it is about emptying our lives so they can be more full, right? THank you Susan…yes blndness has a way of teaching me some very valuable life lessons…. This was a beautiful post and the quotes reminded me that we experience things in a variety of ways, seeing is only one of them. We are also having a spiritual experience. It sounds a lot like your trip tapped into that part of your experience, too. I know it did mine in the reading of your beautiful post. Jeanette-thanks for your lovely comment…yes the older I get, the more I realize that ALL of life is a spiritual experience…the interactions between God-Earth-Man and what a privilege it is to breathe! Thanks for reading…are you struggling with vision loss?